The conviction of Lalu Prasad resulted in a slugfest between the Congress and the BJP with the opposition party. NEW DELHI: The conviction of Lalu Prasad resulted in a slugfest between the Congress and the BJP with the opposition party saying that the RJD chief had been made a scapegoat and the saffron party slamming the grand old party for supporting a tainted ally. The Congress backed ally Lalu Prasad, who was convicted in the fodder scam case, and trained guns on the BJP asking why the Centre was not probing the Srijan scam in which Bihar Chief Minister and JD(U) chief Nitish Kumar was an accused. “The central charge against Lalu Prasad is alleged embezzlement of treasury funds…I want to ask the BJP why is it not probing ally JD-U in the Srijan scam where the central charges are almost the same and the quantum of embezzlement much more than the fodder scam,” Congress spokesperson Manish Tewari said at an AICC briefing.“Lalu Prasad has been fighting this legal battle since 1996 when the probe started after some BJP leaders petitioned the Patna High Court. 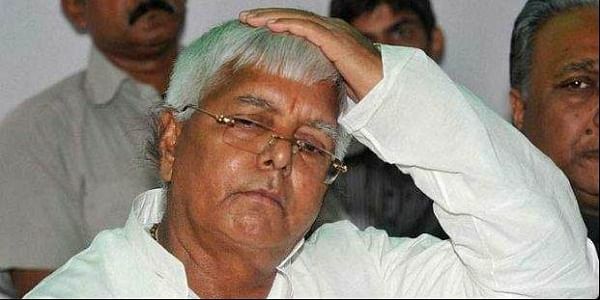 As far as today’s judgment is concerned, Lalu Prasad and his lawyers are competent to deal with the issue,” he said. “Lesson of today’s conviction of Lalu Prasad is that law will catch up with you if you commit corruption,” Union Law Minister Ravi Shankar Prasad said.Another central minister J P Nadda branded the alliance between the Congress and the RJD as a grouping of the corrupt. “The alliance between Congress and Lalu Yadav’s party is an alliance of corruption, connivance and cheating the people of India,” Nadda said. “Lalu Prasad Yadav is even now politicising the issue instead of accepting the verdict, just to deviate he is leveling allegations of conspiracy on BJP,” he said.The Congress used the occasion to slam the CBI saying the agency was behaving like “a pet performing parrot of the government”. Interestingly, the SC had described the CBI as a “caged parrot” while hearing the coal scam in 2013. The Congress is miffed that the Centre is ignoring the Srijan scam to allegedly protect Nitish Kumar, who broke the Congress-JD(U)-RJD grand alliance in July and became CM with the BJP’s support. Weeks before that, Nitish had pressured the Congress to dump Lalu’s son Tejashwi Yadav, but the party sided with its old ally.